I have recently started on a new layout which I have named Teasel Bay. 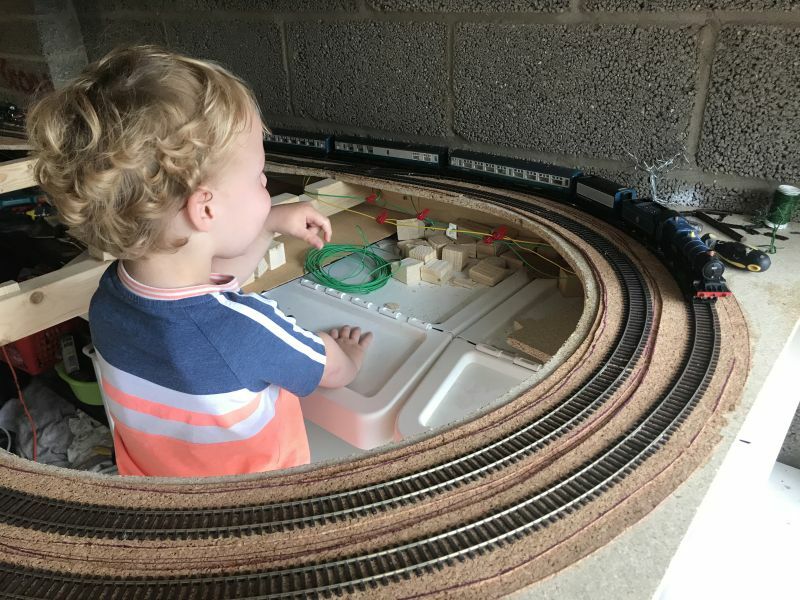 I am a complete novice as my original layout was a simple board with an oval or two in my early teens. A dropped the hobby for a number of years and now I have a reasonable space I have decided to have some fun. While going through the process of buying the new house I browsed this forum looking for ideas, there are some very impressive layouts on here, if I can make Teasel Bay look half as them I'll be happy. 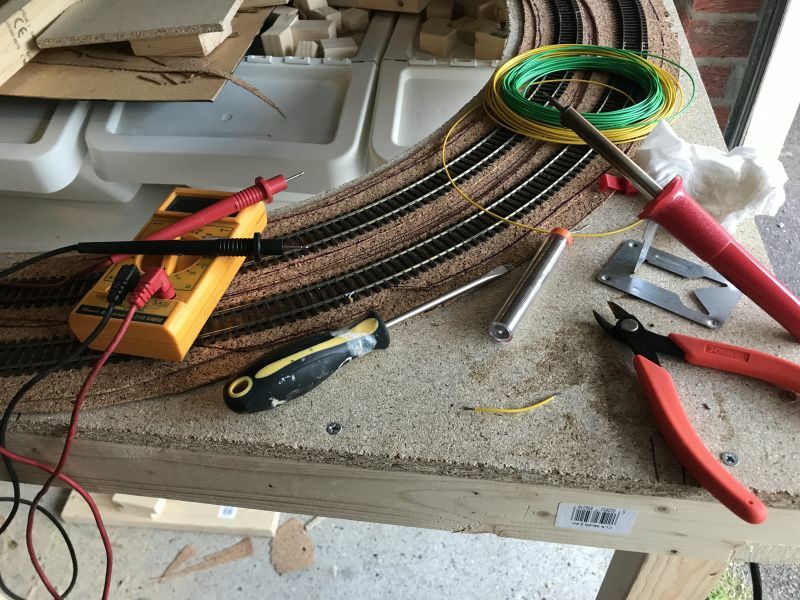 A lot has changed in the 15 years I've been away from the hobby, the advent of digital control which will reduce the wiring considerably and allow me to run many trains at once with ease. 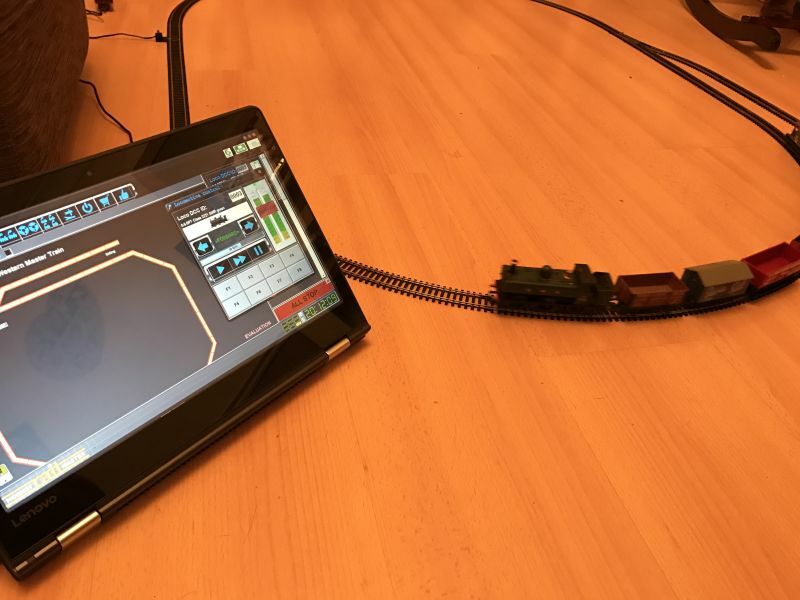 I am not really a fan of the Hornby Railmaster software, as a software developer by trade I have set out to write my own control software as well as build the railway! I hope you enjoy watching the progress as the layout slowly advances and any helpful tips along the way will be greatly received. How many people start with an oval of track on the living room floor? I decided to start with the Western Master set for £100 as it came with the eLink, Railmaster and a 0-6-0 Pannier Tank to kick me off. 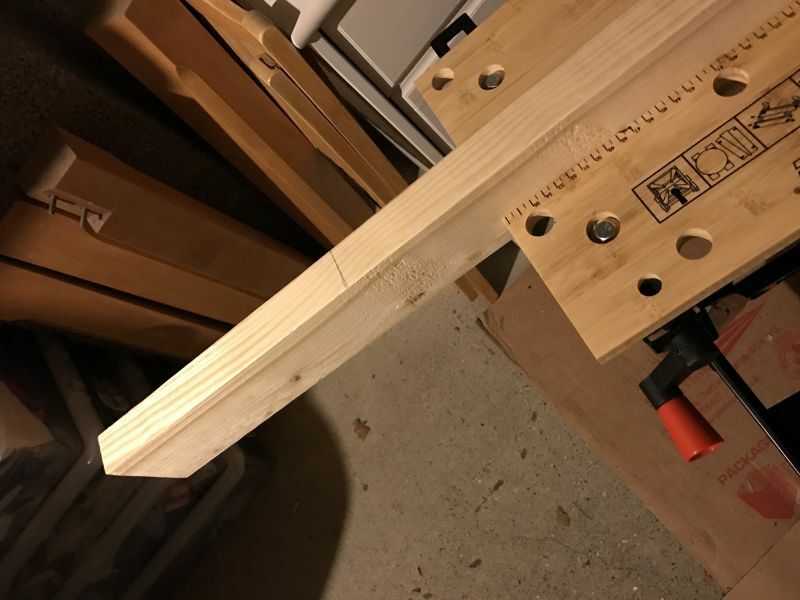 The first cut... I decided to go with a simple wooden frame as its easily to work with. 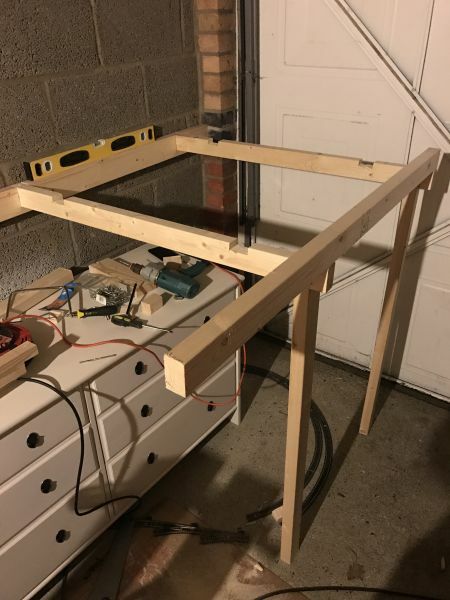 My woodwork skills are nothing to shout about, I have used common sense on my joins and pure educated guess work, which seems to have worked so far. 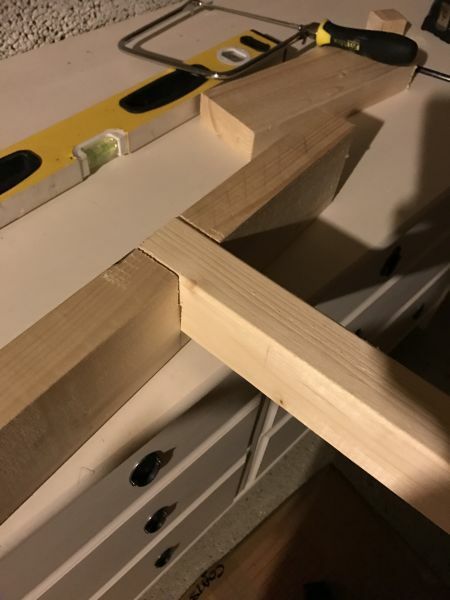 Above, the first join. Taking an U shaped cut out of the main support for the cross sections. Below the first "block" is constructed checking we are level as I go. My plan is for the tracks to remain relatively level with an upper and lower level. Initially I'll be focusing on the lower dual "L" shaped loops with the upper to be built at a later date. 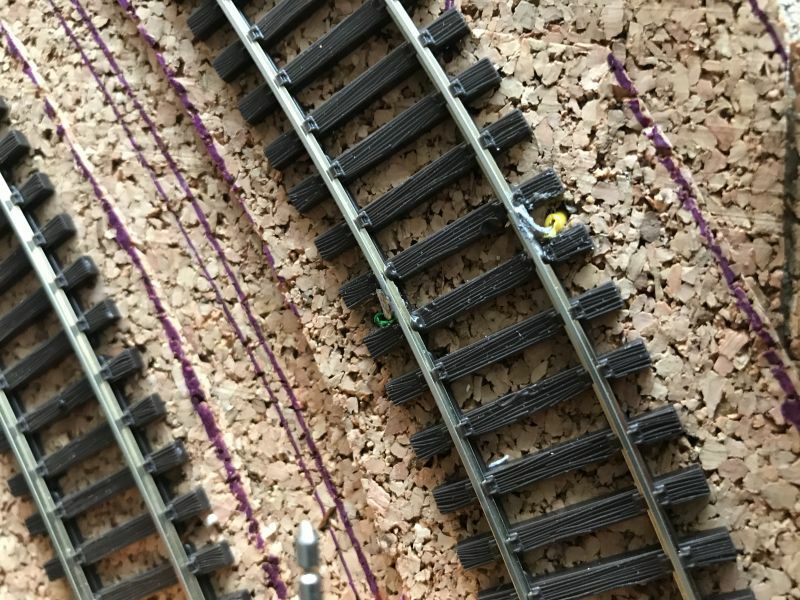 Using old Hornby track on the floor to work out the minimum clearance needed to get a very tight turn 2nd on the inner 3rd on the outer. 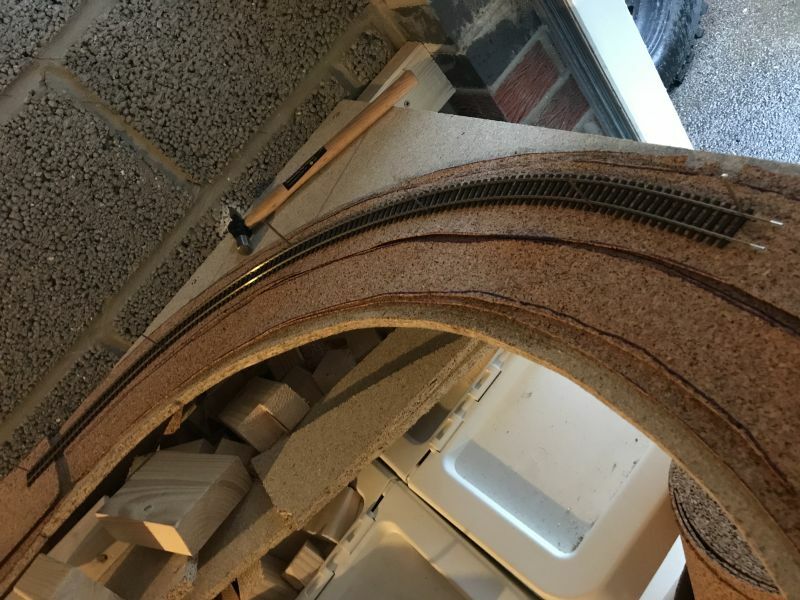 Unfortunately need to be tight to fit it in the space but the plan is for this to be hidden under a tunnel so only more realistic bends are modelled. 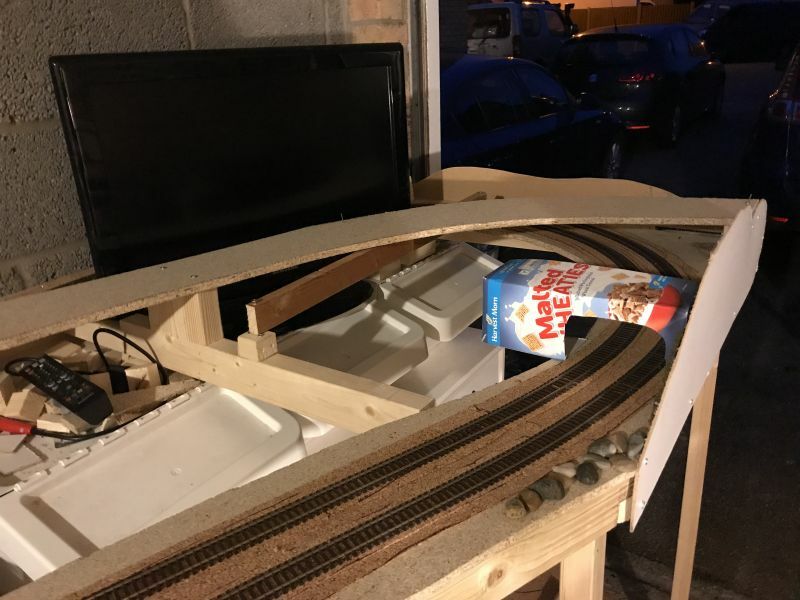 As the track heads into the garage the width of the layout is reduced to allow more room around the layout and I plan to eventually add a beach here to give Teasel Bay its namesake. 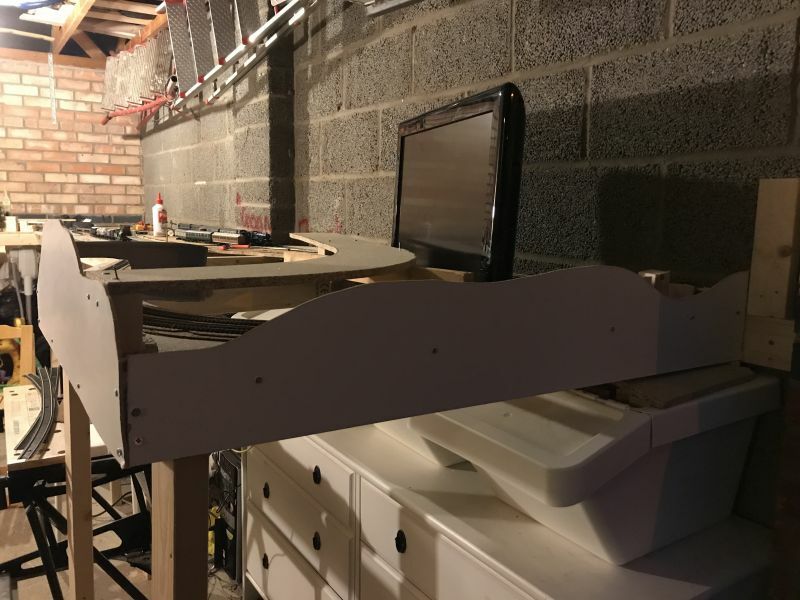 At the back under scenery I plan to have a small set of sidings to allow trains to enter the tunnel and a different train to exit. I hope this will add a bit more interest than a simple oval. Eventually the plan is to get my software to control this and randomly select trains to run. Looking back to the entrance of the garage. I've added some areas for the wires to run once the base boards are down. Hi Chris Sorry for late Welome to YMRC. Very best of luck with Teasel Bay build. Please keep sending up date plus pics. I'll be interested to watch how you use the Western Master, as I'm running RailRoad&Co. Thank you both for you replies already. I should say that I started the project back in January, so the first few photos are backdating progress. Using old track and the longest carriage for reference I started planning the track position and cutting out the baseboard using a Jigsaw borrowed from a friend. 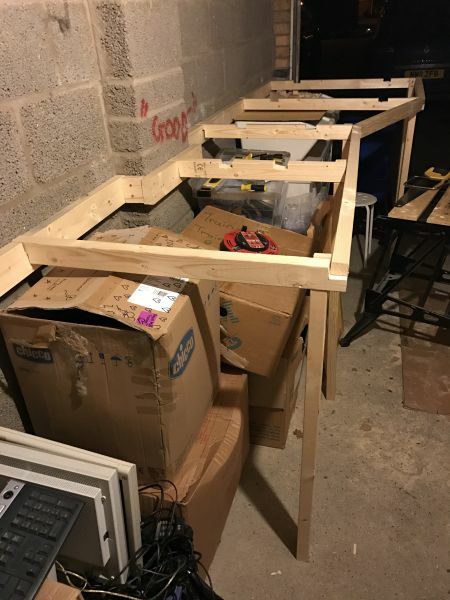 I had not finished the full structure by this time, as you can see the rear support at the back of the garage is resting on stuff before being fixed into place. On the photo below you can read "Good bye" written in paint (well I hope it ins't blood) which was there when we moved in! Progressing slowly around to the rear of the garage. As you can see eventually the layout will be hiding quite a bit underneath! 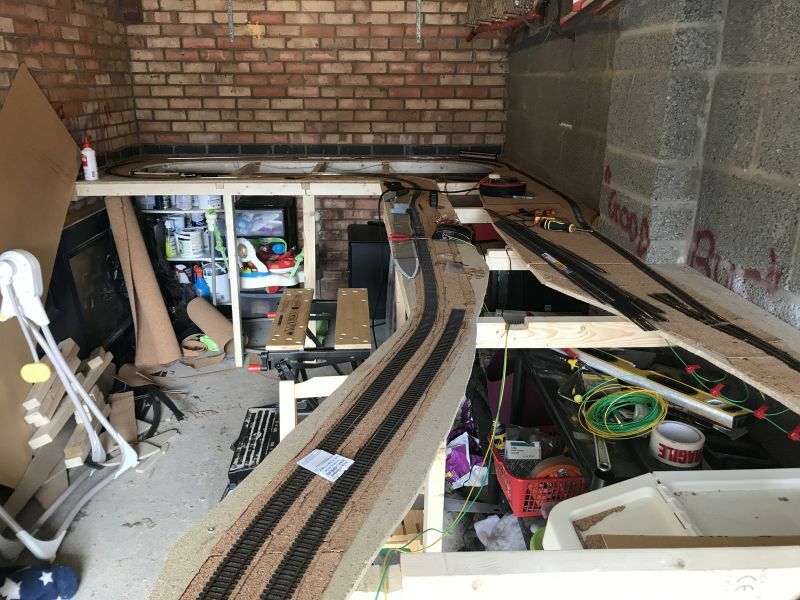 Finally laying the old track to loosely plan the layout over the completed structure at the back of the garage. Phase two will eventually see a second oval around the edge of the garage with a removal section at the front for access but that is far into the future. Looks like a good structure. I wish I could get into my garage, it's that full of junk! I went with a cork underlay which is 2mm thick which is used for floor underlays. I decided to have a sheet under both tracks and a single sheet under the tracks stuck down with standard PVA. I have thinned the width of the upper sheet since this photo. 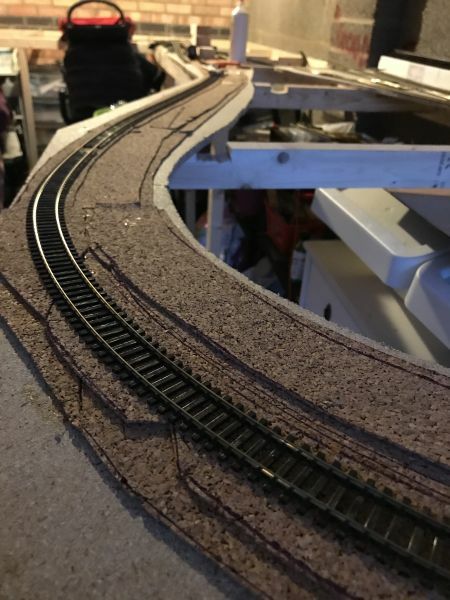 After lots of research I decided to use Peco code 75 track as I liked the finescale look. 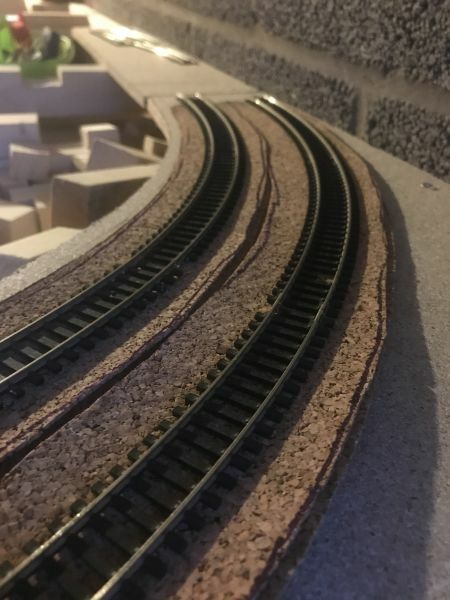 Using flexiable track allowed me to gradually reduce the radius of the corners to the straight to allow trains to run smoother. 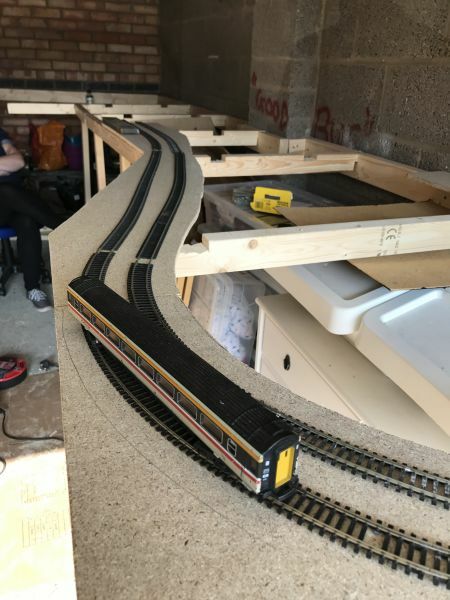 After laying a couple of sections of track it was time to test. Connecting the output from the eLink using two files to hold the wires onto the bottom of the track. Back to the old track to plan out the storage yard, looks like I can fit three tracks per circuit. The structural column unfortunately reduces the space available for the yard. My high tech solution below to temporary hold the wires to the tracks. Pulling the tracks out just before the turn to give the track enough space to get around the corner. The plan is to have a bridge at the end of the station to hide most of the turn. Had to pull up some of the cork to re-route the track but you won't notice once some scenery is down. Continuing around the back of the garage. 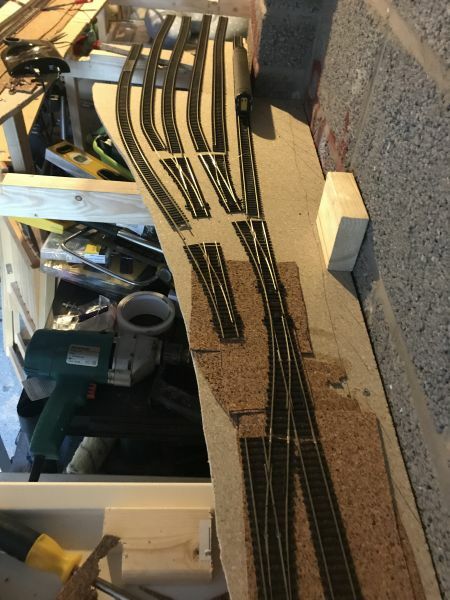 The curves on the left hand side will be hidden by a tunnel so all the tight turns are hidden on the layout. 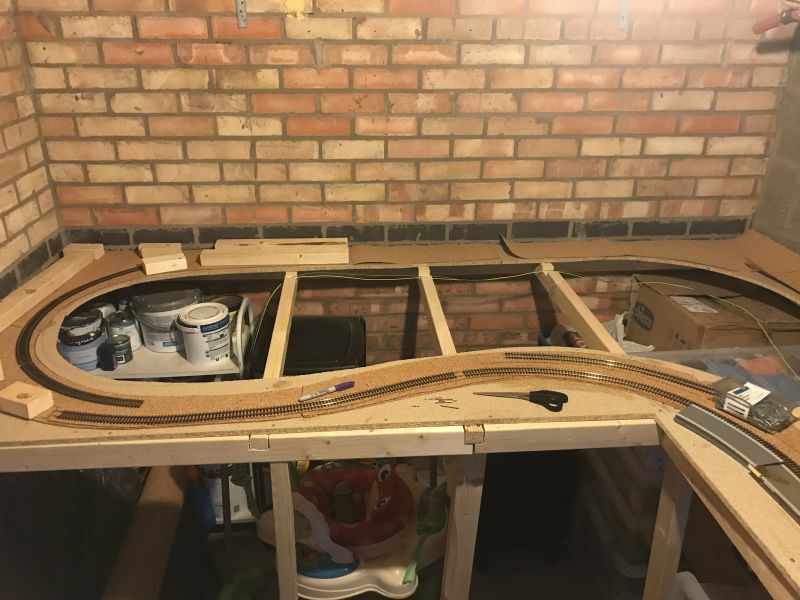 Continuing the cork and track around the back of the layout. Finally, first loop completed! View of the whole layout. Finally the first full run around the layout by the Hornby BR 4-6-0 King Richard II. Hooray, that's a milestone reached. Always a good feeling. Marty wrote: Hooray, that's a milestone reached. Always a good feeling. Indeed it is. 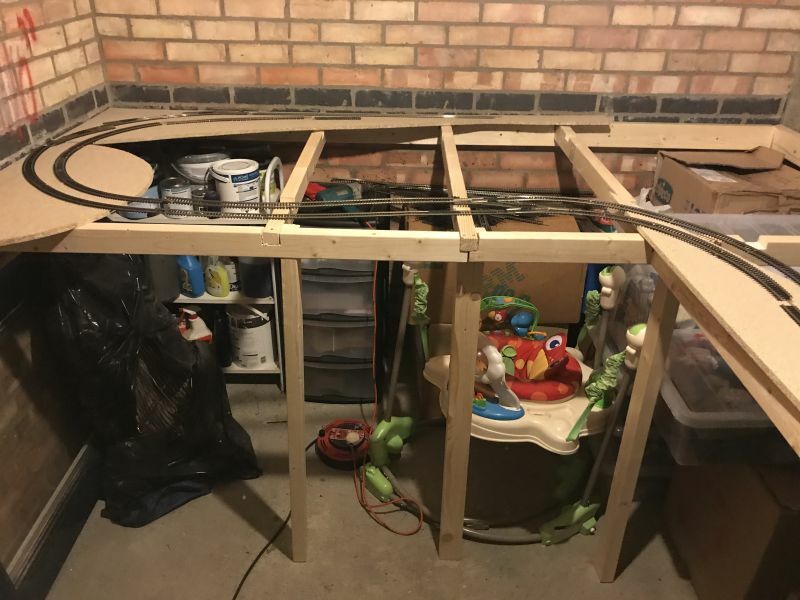 Yeah I've already started on the second loop and the storage area at the back to start making it a little interesting! That has been my problem recently, rather than do "work" with I've been "playing". I bought another engine rather than spend it on more track/scenery! I have a long long way to go yet but I'm on the way! After carpentry it is now time to brush up on electronics. As I the layout is digital this is currently pretty straight forwards. As the layout is digital I opted not to use red/blue as there is no sense of positive or negative as the current is alternating. 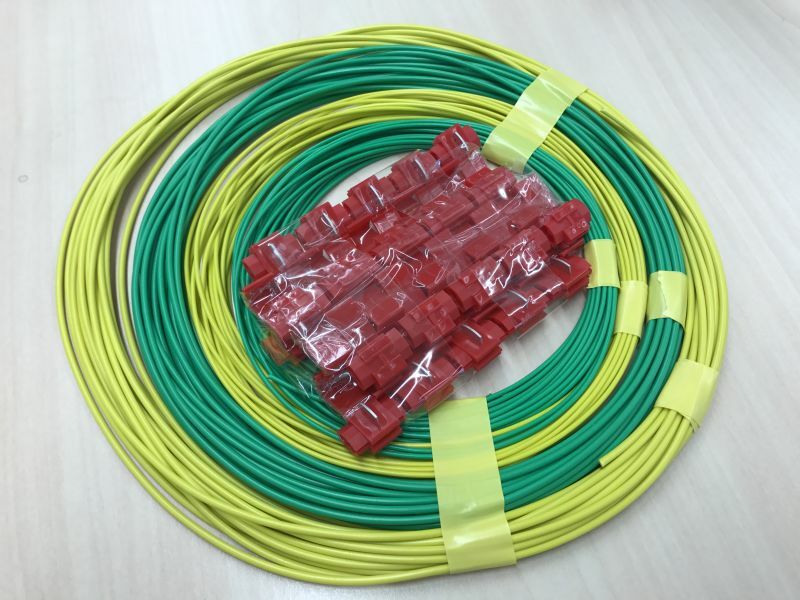 I also decided to green/yellow for the track bus and eventually a second colour set for the accessories I want to be flexible to one day have a different digital controller for the track bus and the accessories, depending on how well the software development side goes I plan to have one machine as the router controlling signals/points and a second which will then run the trains within that system. 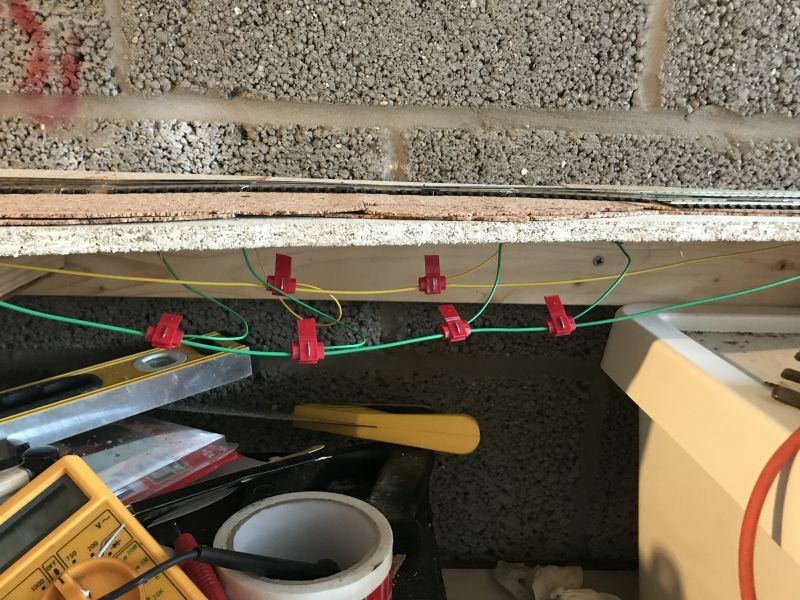 I also found online the little red clips above which break the insulation on the bus wire and link to smaller wires dropped from the track. 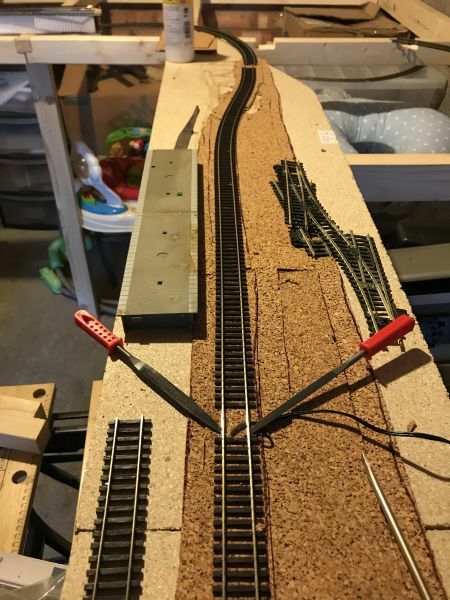 After doing more research online I went with the technique of soldering the center of each length of track to ensure power is consistent across the layout. Not too bad for my first go... I chose an area easy to get to which will be hidden under a tunnel for the first few until I'd perfected my technique as to not melt the sleepers! For the point work I choose electrofrog for the clear benefits of allowing trains to run smoothly over them, even with the Pannier Tank's small wheel base it quite happily moves over them at slow speeds. As recommended I cut the little wire under each point and for now hard wired the frog so trains can only run staying on the main line. Eventually as money allows I'll start buying some Colbalt Digital IP motors to switch the point and the frog. Got the seal of approval from the toddler who now gets very excited when coming into the garage repeating "Choo choo" over and over. For the purists reading the train was picked out by my toddler, so ignore the double tendered King! 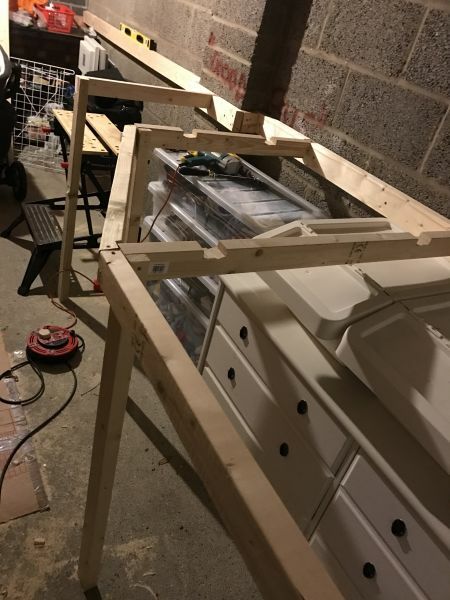 Finally started on some scenery which will bring the layout. Starting at the entrance of the garage which will consist of a tunnel to hide the sweeping turn returning into the garage. 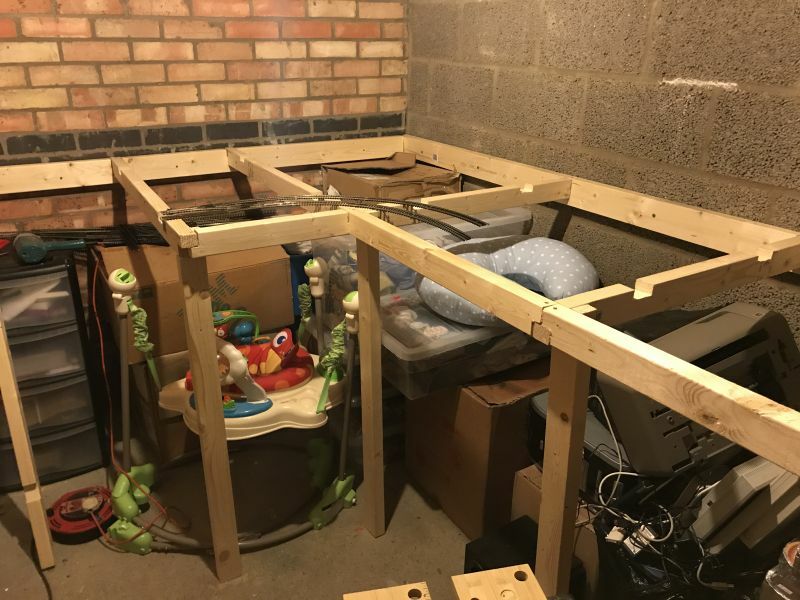 Started with the upper level track base which eventually will give a double loop around the parameter of the garage. The tunnel entrance marked out with a Malted Wheats box. 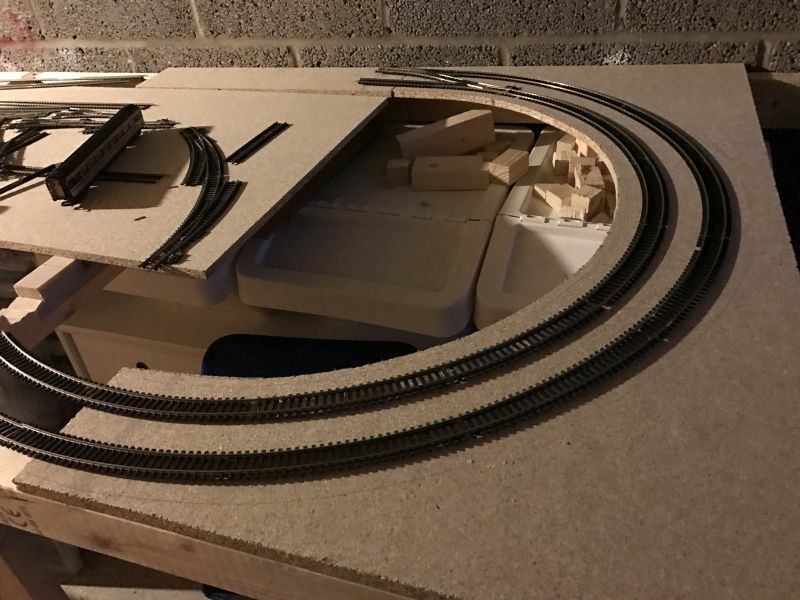 The contours of the front of the layout match the sliding door sections allowing it to raise and close without hitting the layout. Had to be carefully planned out before cutting. The monitor which shows an overview of the track and (hopefully eventually train positions) will be attached permanently to the wall in due course! Hope these little updates are of interest to someone. I am really enjoying problem solving in the build and imagining how the layout will look in a year plus! It's going to be a good one - watching with interest. Always good to get the little ones' seal of approval! 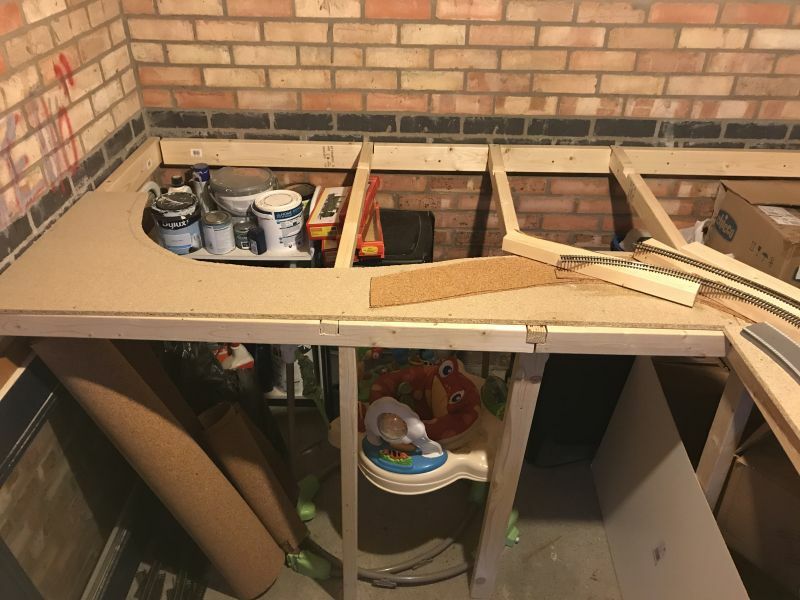 I'm renovating the kitchen and preparing for our Convention on the 16th and 17th, so I'm a bit distracted at the minute. If you're referring to the wiring arrangements, I've been embroiled in this discussion many times before. Chris has already invested in his materials, so there's not much point in annoying him. I must be mellowing in my dotage.